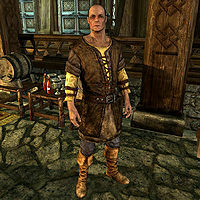 Brill is a Nord citizen of Whiterun, and can be found in either Jorrvaskr or Dragonsreach, depending on the status of the civil war. Brill wears a set of farm clothes along with a pair of boots. He wields a Skyforge steel dagger and carries a selection of common loot and gold. Brill is frequently seen in the company of Vignar Gray-Mane, to whom he owes a debt of gratitude for saving him from a troubled lifestyle. His attitude towards Vignar includes quotes such as "I'd be dead if not for Vignar. He took me in and helped me turn my life around." and "I had a bad time a few years back, an' I turned to drink. But Vignar, he wouldn't let me stay weak." He sees Vignar as a father figure, and acts as his aide. Consequently, he will replace Proventus Avenicci as the steward of Dragonsreach if and when the Stormcloaks conquer Whiterun, which leaves Vignar as the new jarl. Like Avenicci, he will sell Breezehome and its furnishings, as well as Tundra HomesteadCC. If you ask him about his new role he will be optimistic and say "Well, it could be worse. The former steward, Proventus, kept very detailed records." before adding "But yes, it's been a lot of work. Vignar doesn't want the change to disrupt the lives of his people. They've got enough to deal with already"
He will also add that "Vignar and I have our hands full. It's no small task, running an entire hold." and "When I became Steward, I had to give up the bottle. The people of the hold need me at my best." He does not appear to be worried about the dragon menace and if you ask him about the danger of a dragon attack he will confidently tell you "And we've done as much as we can to prepare for that. But remember, Whiterun is home to the Companions. Any dragon that comes here will get more than he's bargained for, I think." It seems that Vignar is not fond of the Companions and Brill will say that "To hear Vignar tell it, they're a bunch of layabouts and useless whiners who used to know how to fight.". However, it soon becomes clear that Brill does not share this view after he quickly adds "But he thinks everything used to be better. I, for one, would trust any Companion with my life." If Brill is killed while he is steward to Vignar Gray-Mane (after the Battle for Whiterun), Proventus Avenicci will return from exile to replace him in this position. He will offer the same dialogue as if Jarl Balgruuf still controlled Whiterun. Brill can be told that there is still the threat of a dragon attack before Mirmulnir attacks. Additionally, his reply makes little sense unless he is steward. Nonetheless, this dialogue is always available. Brill may not replace Proventus Avenicci as steward. ? Attacking Brill may reward you with bounties in wrong holds, like The Reach and Eastmarch. ? This page was last modified on 3 June 2018, at 17:29.